Usually photographers work hard to avoid lens flare. It can be distracting, causing metering issues and introducing specular highlights. Sometimes, however, you can take advantage of it. For this technique to work, the sun needs to be near the edges of the frame, so check the forecast before you head out, and shoot early or late in the day when the sun is close to the horizon. 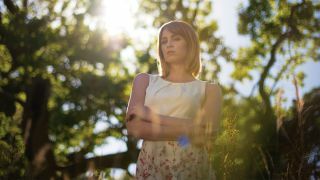 Position your model between the camera and the sun; the low sun will backlight the subject and give you some great flare. Don’t look directly at the sun through the viewfinder, though; if you’re concerned about this, use Live View to compose your shot. Most manuals tell you to “keep your lens free from dust” – well, break the rules this time! Specks of dust on your lens or filter will light up and create interesting textures. Just take care when taking any dust off, particularly if it’s on the front element of your lens rather than a filter. Finally, don’t just stick to one position – move around to change the perspective. Just be sure to keep your model between yourself and the sun. If the sun is still a little high, try getting down low. We laid down in some tall grass to place the sun behind the model, and allowed the grass to intrude in front of the lens to add spots of blurry highlights and enhance that intimate mood. The properties of your lens and the image sensor of your camera body effect how much lens flare you will get. Typically, those with modern coatings will reduce flare, while older lenses without such coatings will struggle to keep it down. Place the model between your camera and sun. The flare will wash over your model. Be aware of the background, too: we also used an oak tree to help illuminate the background, as the backlight on the leaves was particularly pretty. Zoom lenses with multiple glass elements tend to produce more flare as they increase the scattering of the light. Older lenses often flare more; we used an older M42-mount Tessar f/2.8 50mm Carl Zeiss Jena lens for a different look. Set your camera to aperture-priority mode. If you expose for the sunlight, the model will be too dark. Set some positive exposure compensation to brighten the model, and bounce light in using a reflector so you have a balanced exposure. So-called veiling flare is the haze that seeps into the frame from the sides. Allow it to fade as it reaches your subject so you have a clear view of them. It can and should overlap your subject, but ensure you can still see them through the haze. If the flare obscures your subject, move the light source to the edge of the frame by stepping to one side. By moving slightly, the ghostings are pushed to the opposite side of the frame, but, again, make sure you don’t cover up faces.